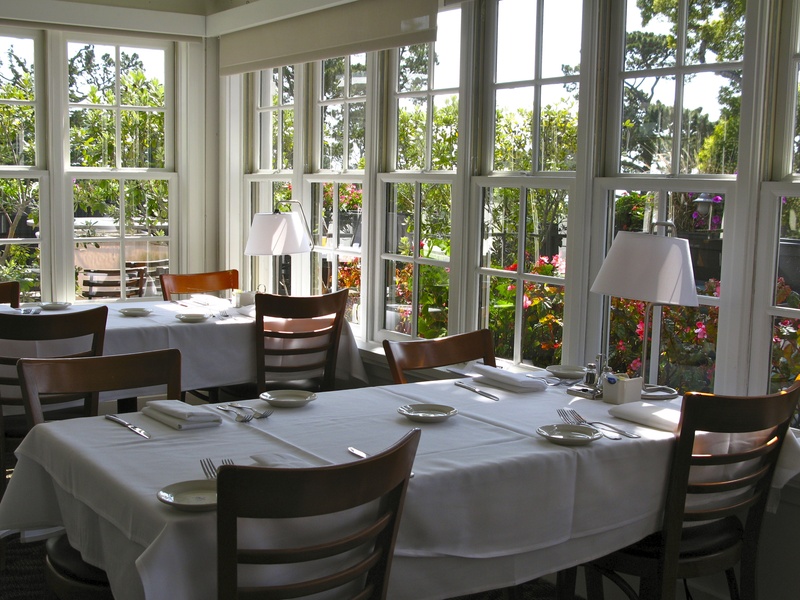 IL Fornaio Restaurant in Carmel -by -the Sea is a lively and popular dining spot for Pine Inn guests and Carmel locals alike. When Bill and I first move to Carmel, I search for a great spot to have a cup of coffee and read the paper before Bill wakes up and we have breakfast together. 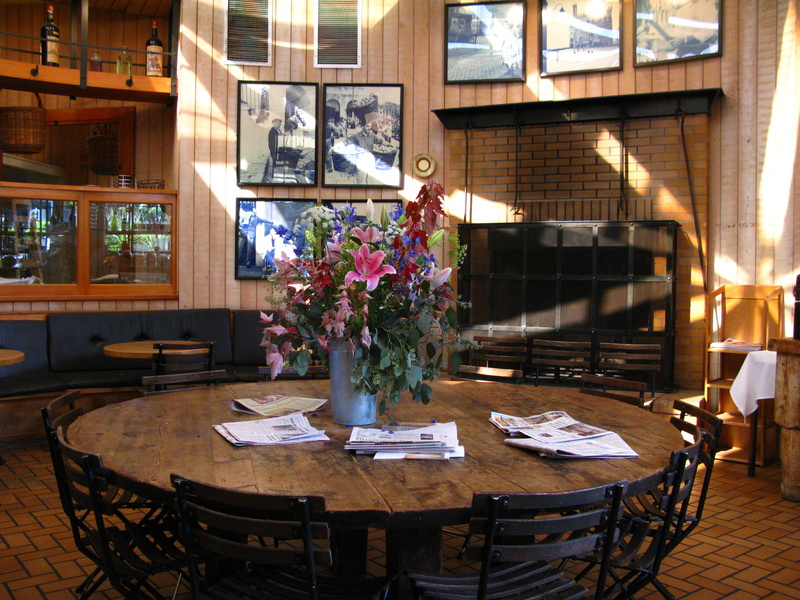 Our neighbor tells us about this restaurant with a big round table, warm fire, newspapers , fresh coffee and delicious pastries . So I give it a try. What an inviting space. The room he describes is under a glass gazebo in the Pine Inn. 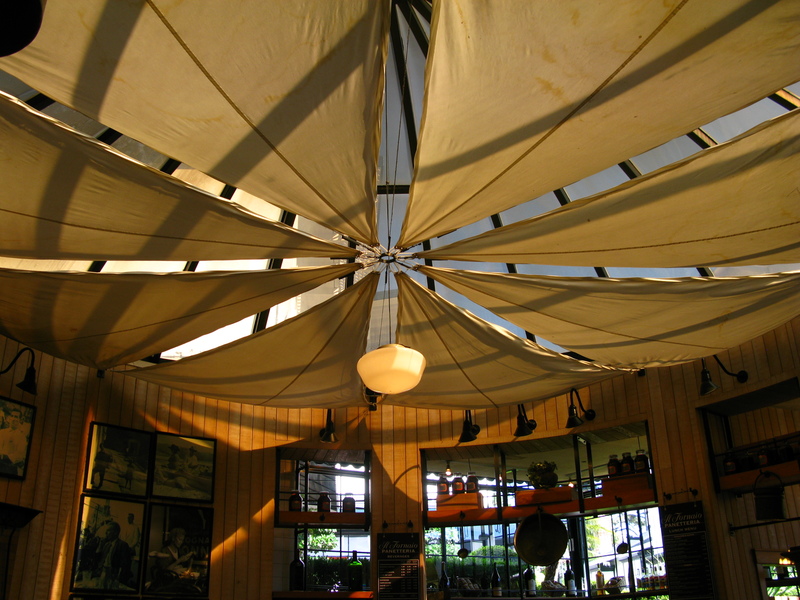 Much of the time,canvas awnings regulate the light. sit in front of the fire and read and talk to others. It is a great place to pick up local gossip! 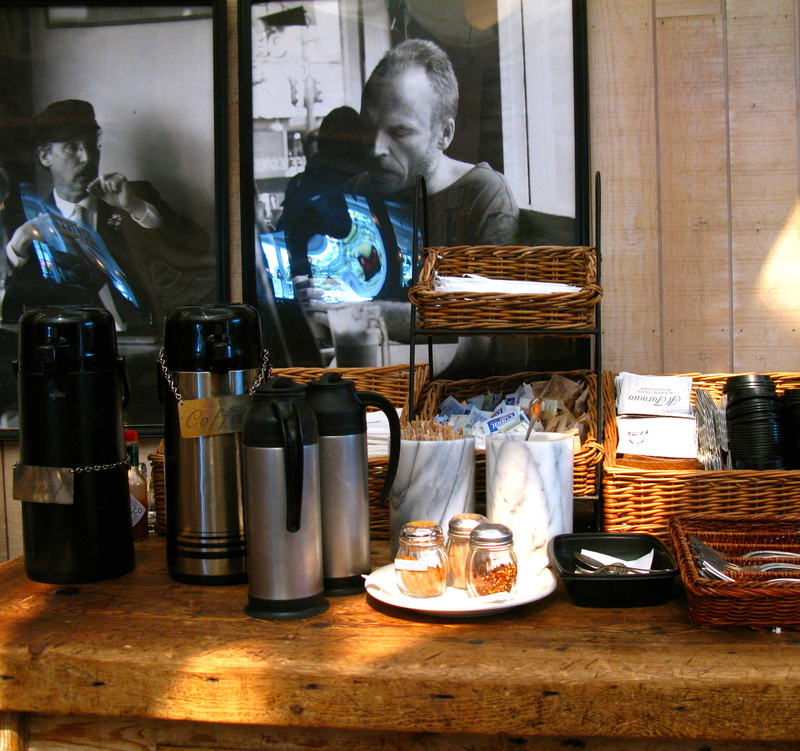 The bakery offers sweet pastries baked in-house. 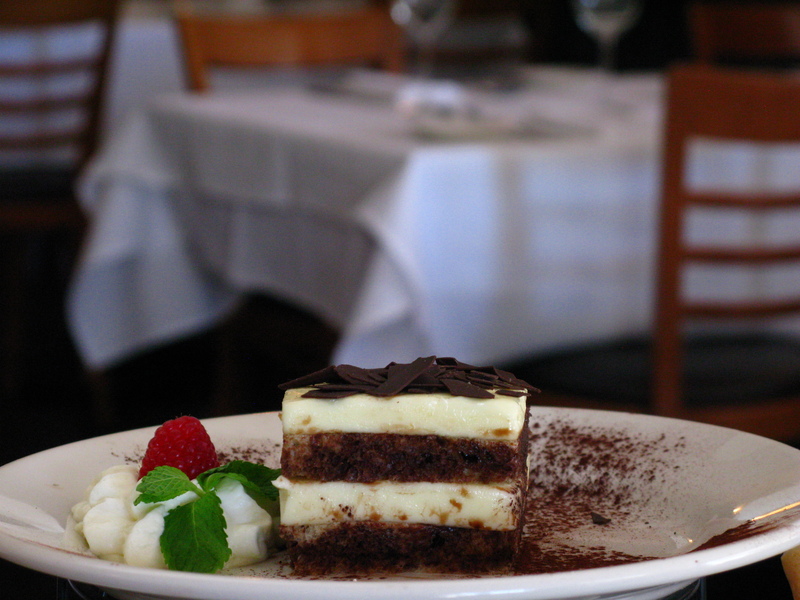 Il Fornaio starts as a baking school in Lombardia, Italy. 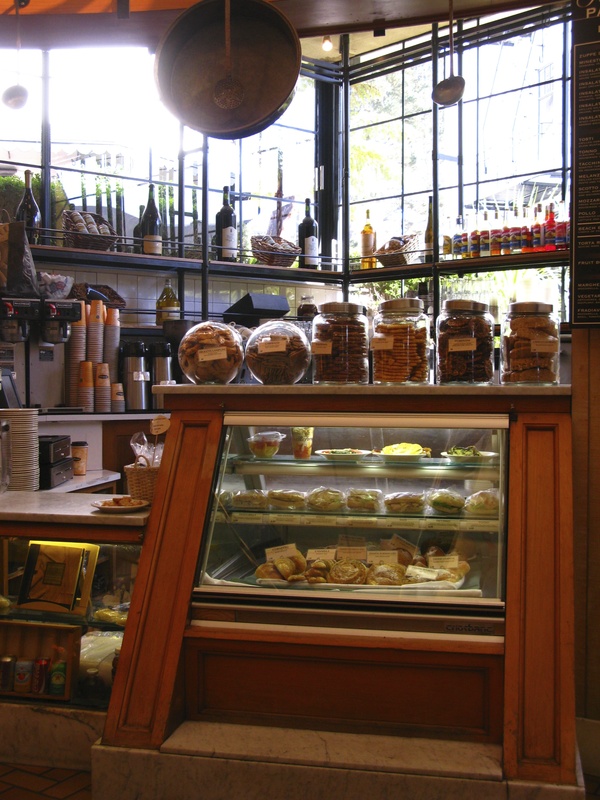 It then opens its first retail bakery in Milan and is eventually imported into the US by William-Sonoma. 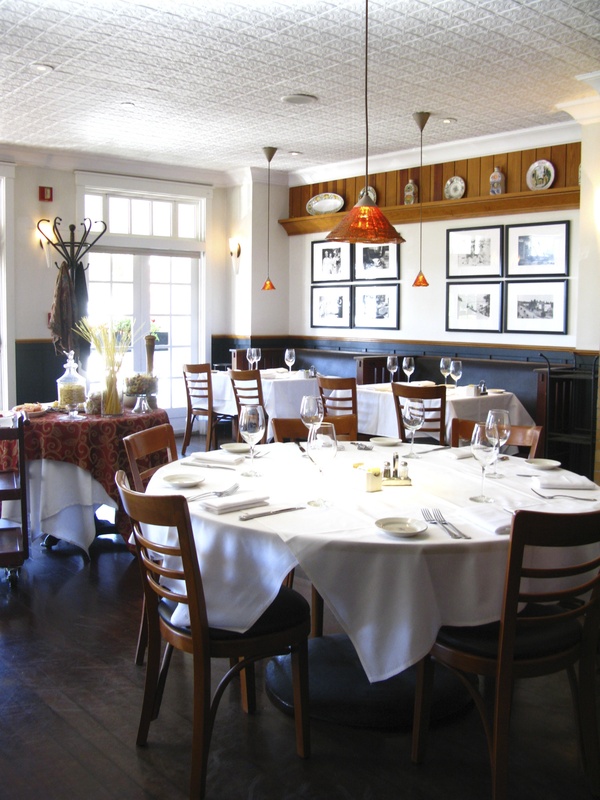 Il Fornaio opens its location at the Pine Inn in October 1995. 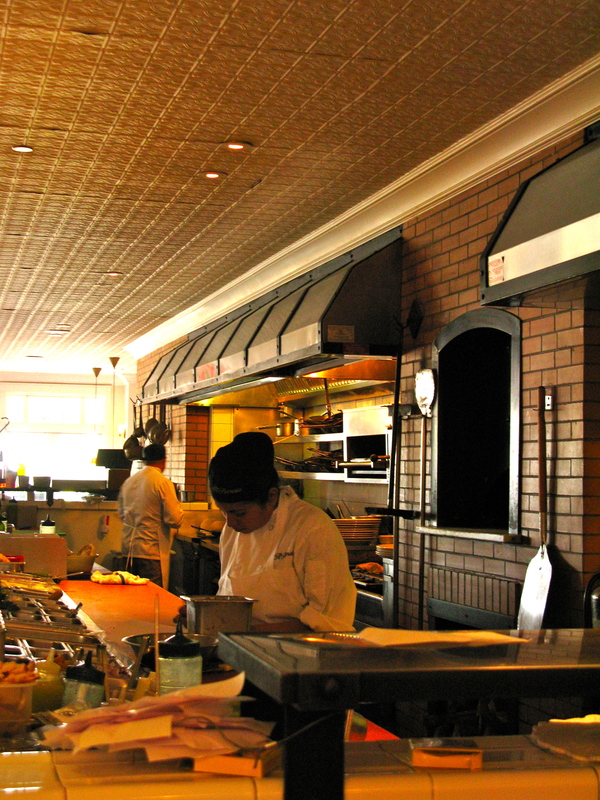 Although this is a “chain”,the ambiance is unique to Carmel. I am here today to photograph and the manager gives his “ok” as long as I bring my photos back to him for his approval. 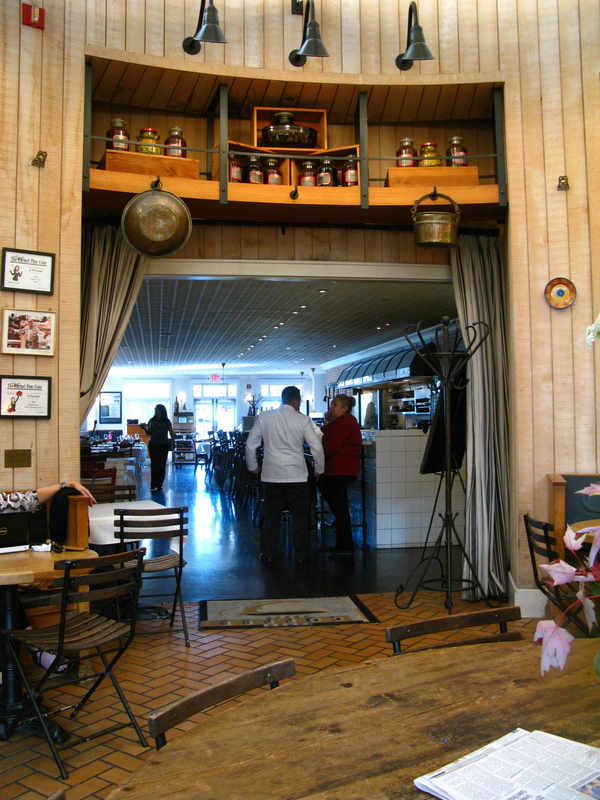 I leave the bakery and enter the main room of the restaurant. It is late afternoon and the staff are preparing for the evening. This is the first time I get a seat at the bar without waiting!! 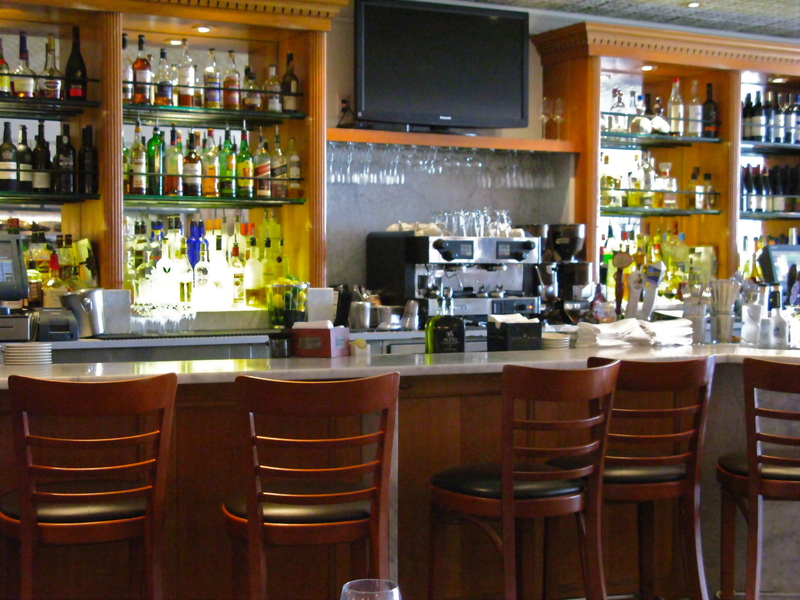 It is a spot that locals love for HAPPY HOUR. The bar is pretty with its central display of martinis. It is “the place” to take a first date, meet a first date, go after a round of golf, or meet after work. After we grab a seat, I assign Bill to listen to the conversation on his side while my ears swivel to my side. Later we compare notes while we have dinner. 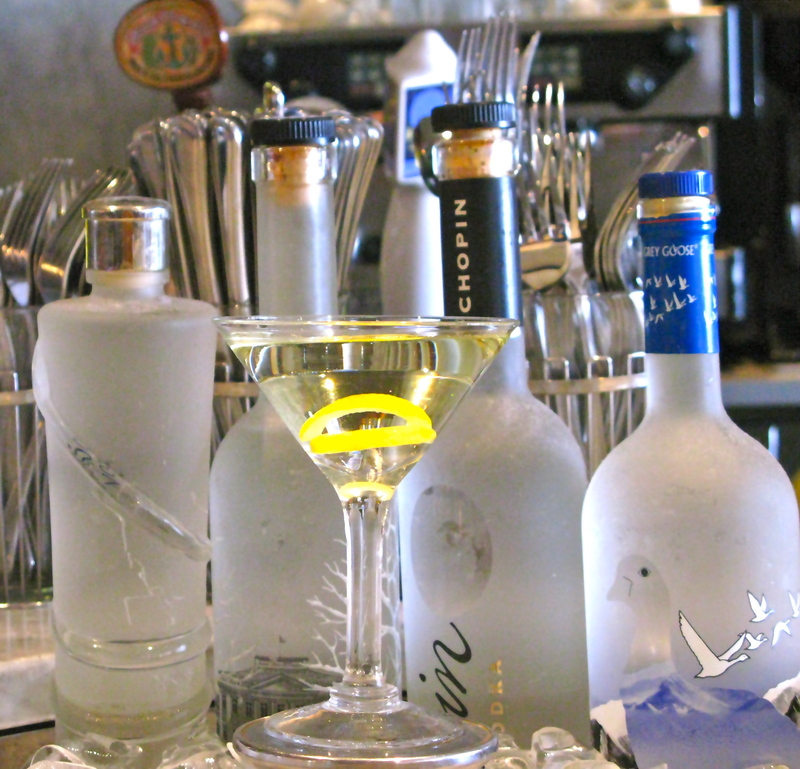 The bartenders are efficient and fun and love to share a new recipe or learn a new one from a customer. 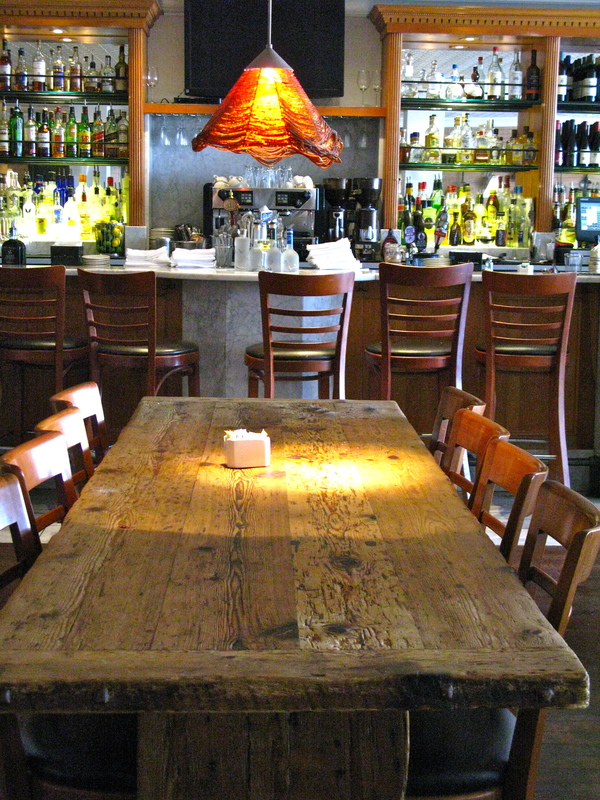 This long table used to be loaded with complementary pizza slices and antipasta. This has given way to an inexpensive happy hour menu that is quite delicious. 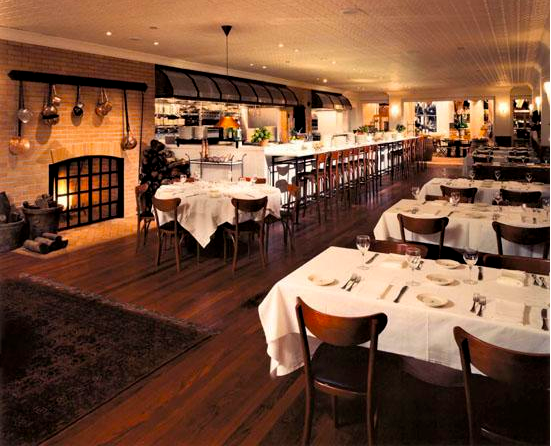 One evening ,the restaurant is so full that we sit at the bar on the other side of the main room. 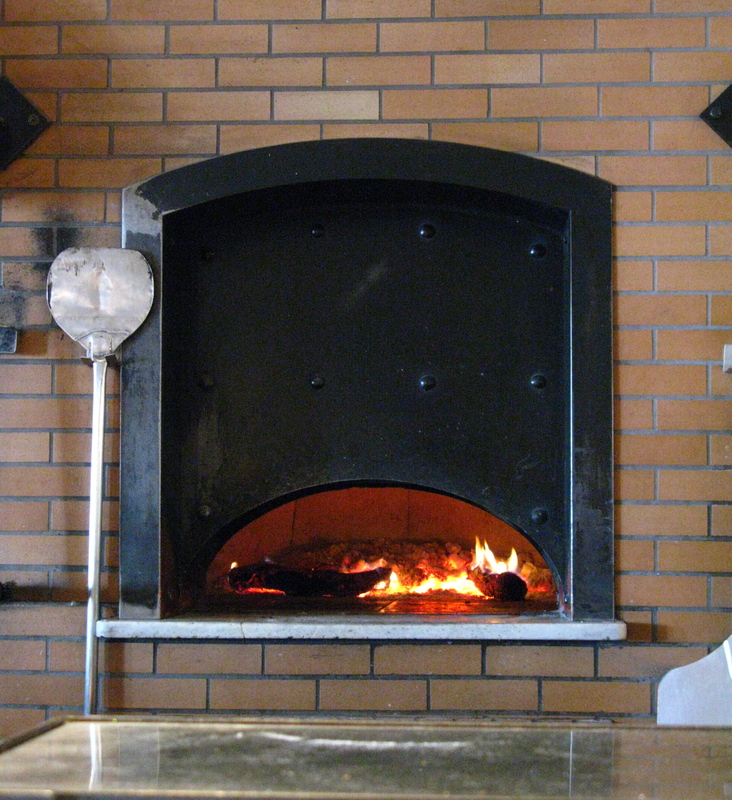 and keep an eye on the wood fired oven baking the pizzas. 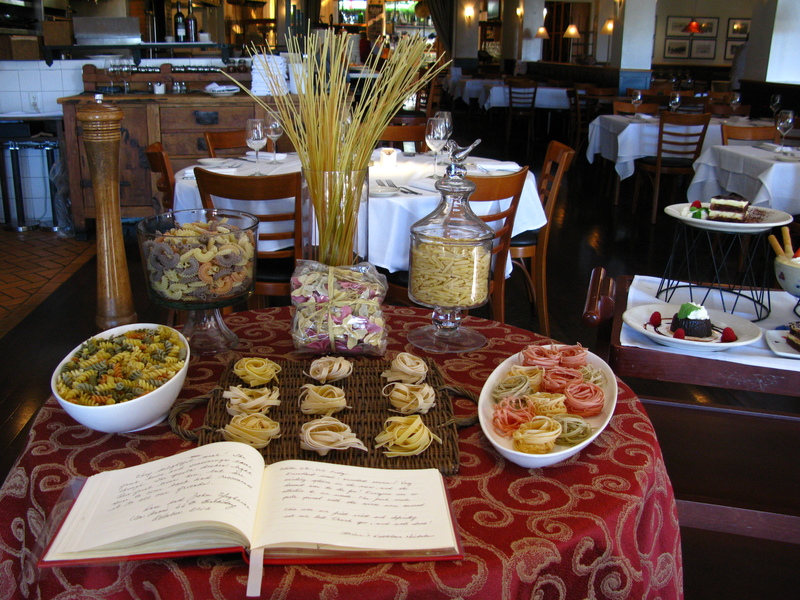 you see a table displaying the dried pastas imported from Italy. 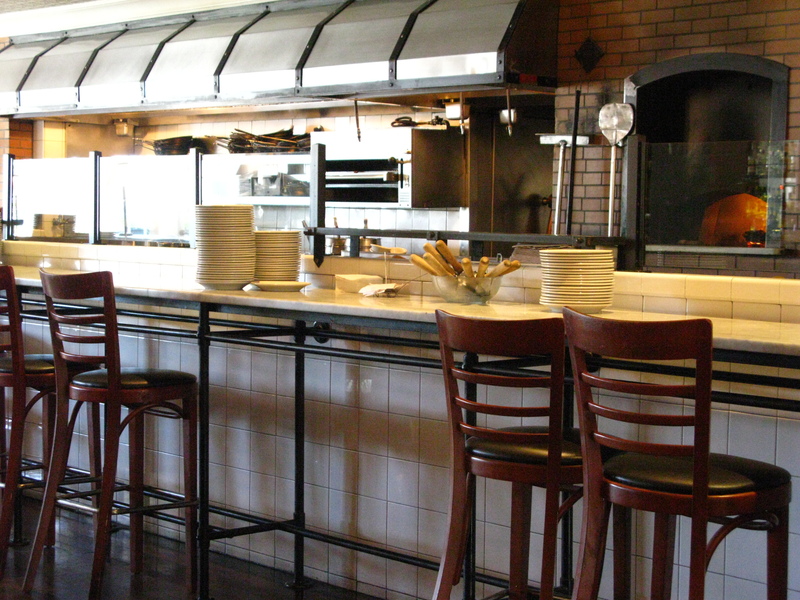 Fresh pastas are made in-house daily. 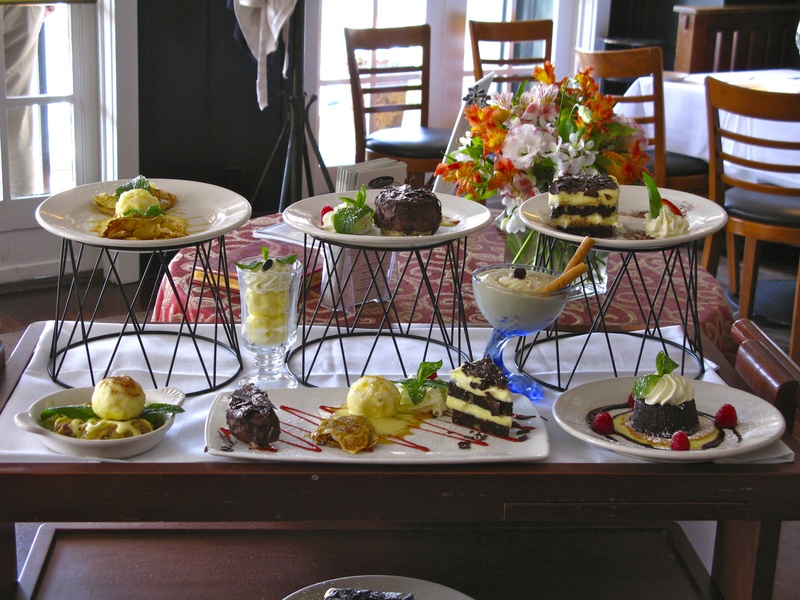 I am encouraged to save room for dessert by the display of desserts. This is the only “food shot” the manager allows. He comforts me by saying ,“ food is difficult to photograph, don’t you think”. I am forced to agree. As you can see this is a large, cheerful space. We enjoy a fabulous meal with a large group of friends during Concours Week. 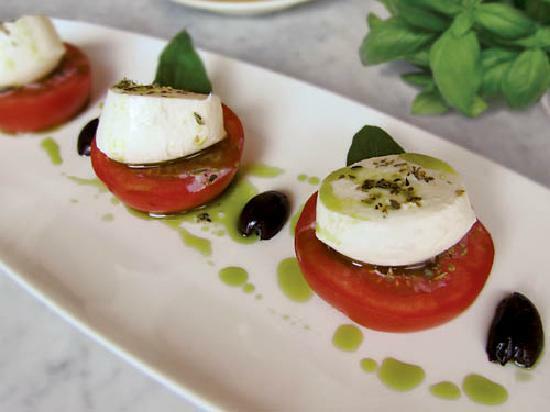 A friend and I make a meal of the Caprese Salad. Several people rave about the Insalata di Bietole- Organic red and gold beets with red wine vinegar, wild arugula, toasted walnuts and asiago cheese; extra-virgin lemon-olive oil dressing. Yum! For more intimate dining, I prefer this enclosed sun porch with its booths , black and white photos and soft lighting. We celebrate here one New Year’s Eve. The service and the food are impeccable. There is also balcony seating overlooking Ocean Ave. and all its action It has a great sunset view. Try the Rosemary bread. The Rosemary grows over the balcony and gives the bread a wonderful aroma. Bill’s favorite entre is Pollo Toscano -Free-range rotisserie chicken seasoned with rosemary; served with roasted Yukon gold potatoes and Tuscan salad. 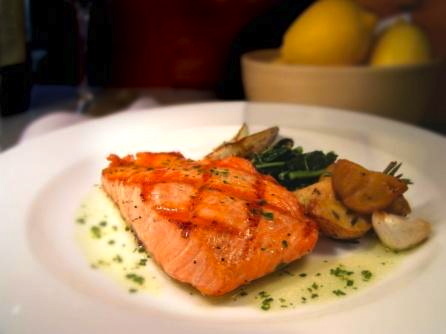 I love any of the Salmon dishes. 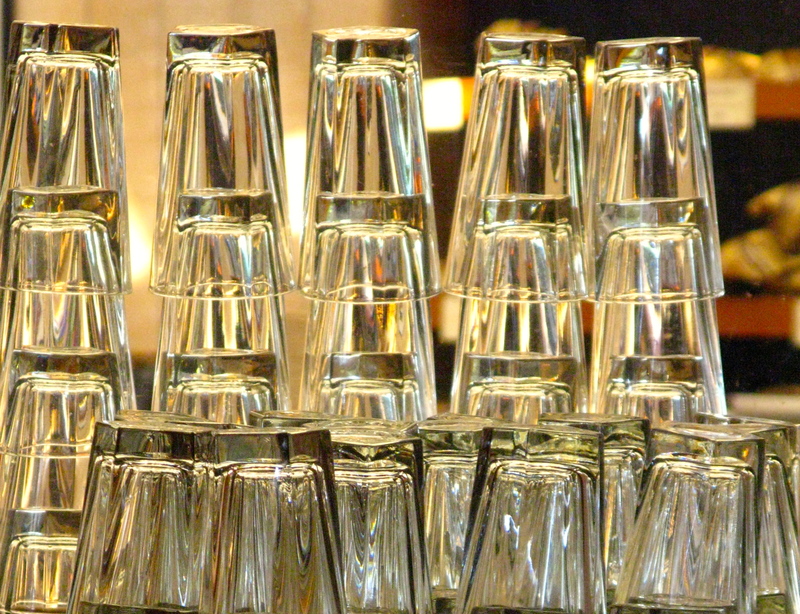 If your time is limited, come for happy hour. I will be the petite blond struggling to overhear everyone’s conversations and “trying her husband’s patience”. Thanks so much for your blog. We lived in Carmel by the Sea for 10 years and your photos and stories just bring me back! It makes me homesick for my favorite home! Boungiorno, mi piace molto Il Fornaio!!! 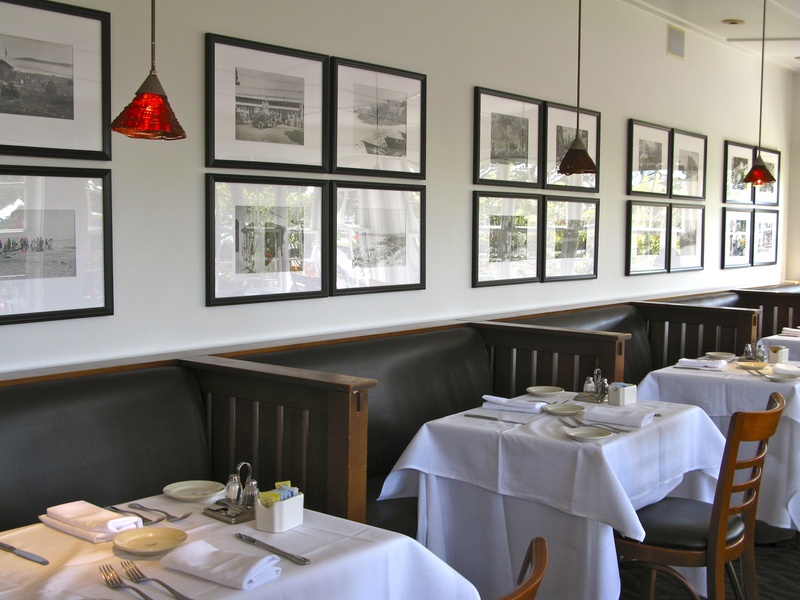 One of the great secrets of Carmel-by-the-sea, I love this place it is cozzy, inviting, the staff is awesome, this is by far one of our favorite places in town…my whole family enjoys Il Fornaio, I wish you could do the same brunch on the weekends :). Buona giornata a tutte le brave persone di Il Fornaio. maybe the manager is right. and maybe he isn’t. he’s obviously not aware that your pictures are of the highest professional standard ~ regardless of WHAT you choose to shoot!!! sadly… it is his loss. 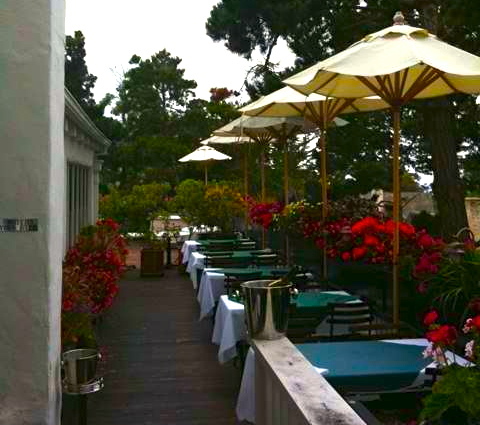 carmel by the sea. thank you! Okay —- I’ve reached you in the most round-about way; via a friend who blogs (Miss Bloomers) who mentioned your wonderful photos of Filoli because I’d just been there (and swooned). Sonia mentioned you also lived here, so went to your blog. Absolutely fabulous and I’ve added you to my list of favorites. It’s interesting to look at Il Fornaio thru someone else’s eyes and viewpoint, as well as the cottages. We’re in PB and don’t take photos at all, so this is for me, an amazing site. Thank you so much and I love, love Beach Music.